H.H. Dudjom Sangye Pema Shepa Rinpoche will be blessing Padma Samye Ling this upcoming Wednesday morning on May 30th! We are very happy to announce that His Holiness Dudjom Sangye Pema Shepa Rinpoche, a tulku of His Holiness Dudjom Rinpoche Jigdral Yeshe Dorje—the Supreme Head of the Nyingma school of Tibetan Buddhism—will be blessing Padma Samye Ling this upcoming Wednesday morning on May 30th! His Holiness Dudjom Yangsi Rinpoche is expected to arrive by 7:30am, so please plan to arrive by 7:00am. We invite you to come early to Padma Samye Ling to help with preparations for this very special occasion. Born in 1990, His Holiness Dudjom Sangye Pema Shepa Rinpoche is the emanation, or tulku of the Buddha’s wisdom, previously incarnated as H.H. Dudjom Rinpoche. He was recognized by many great masters, including H.H. Chadral Rinpoche, H.H. Minling Trichen Rinpoche, H.H. Penor Rinpoche, and H.H. 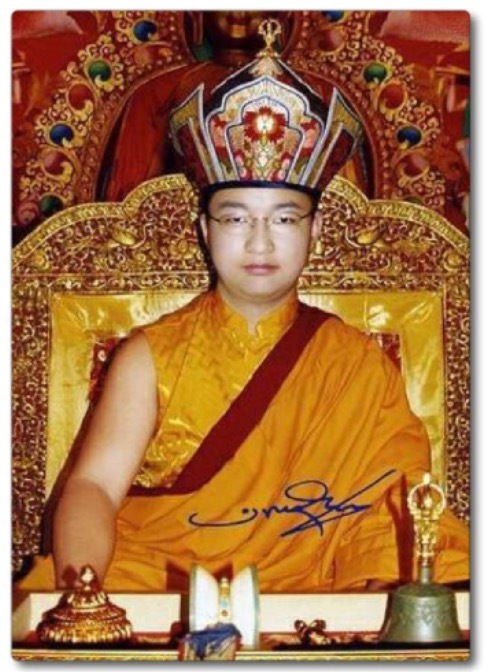 Sakya Trizin Rinpoche. Following the example of his predecessor, Dudjom Yangsi Rinpoche’s childhood and youth have been devoted to study, practice and retreat. Also tomorrow, Tuesday, May 29th, on the auspicious day of Saga Dawa Duchen honoring the Buddha’s enlightenment and mahaparinirvana, Ven. Khenpo Tsewang Dongyal Rinpoche will lead a group meditation practice and vegetarian tsok ceremony at Padma Samye Ling that includes the special opportunity to renew your Refuge and Bodhisattva Vows from 9:30am-noon. Celebrating H.H. Dudjom Yangsi Sangye Pema Shepa Rinpoche’s Visit to Palden Padma Samye Ling!